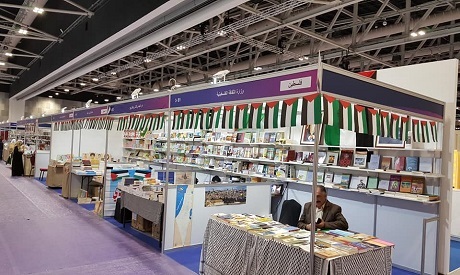 The Palestine International Book Fair opened on 3 May under the slogan Palestine, the Motherland. It runs until Sunday, 13 May. Held at the National Library in Sarda, north of Ramallah, the book fair is host to more than 500 Arab and international publishing houses. During his visit to the exhibition Palestinian Prime Minister Rami Al-Hamdallah stressed the Palestine International Book Fair was at heart a celebration of Palestinian culture and a channel for cultural exchange and communication with all the peoples of the world, but especially the Arabs. Israeli occupation forces, however, have effectively banned Egyptian and Jordanian publishers from the event. Egyptian publishers are particularly angry given they had shipped books to Ramallah in advance. Said Abdou, president of the Egyptian Publishers Association (EPA), says it is common for books to be shipped ahead of the arrival of their publishers to facilitate display arrangements. But having shipped their displays the 35 Egyptian publishers who had applied to participate through the Arab Publishers Association were taken aback when they were refused entry permits. “The Israeli authorities denied entry to Egyptian and Jordanian publishers,” says Abdou. He accused Israel, which sees itself as “an oasis of democracy in the Middle East”, of being afraid of allowing Egyptian books, and by extension ideas, to circulate at the only book exhibition in Palestine. The Palestinian Publishers Association and Palestinian Culture Minister Ihab Bisiso had both been contacted by the EPA, says Abdou, with the latter thanking Egyptian publishers for their contribution to the exhibition. Despite being unable to attend the fair Egyptian publishers refused to retrieve the books they had already sent and asked instead that they be put on display so they are available to Palestinian readers. This is the second time Israeli occupation forces have prevented Egypt from taking part in the fair. “Egyptian books are our soft power in the game of politics, and they must be available for whoever wants them,” says Abdou. Egypt has 1,200 publishers, 60 per cent of the Arab world’s publishing houses. Abdou cites Iraq as an example where, despite considerable challenges and difficult security conditions 200 Egyptian publishers participated in the Iraq International Book Fair. The Palestinian cause and Jerusalem were a focus of this year’s Cairo International Book Fair. Palestine participated, through the Palestinian Ministry of Culture, with a selection of books on the Palestinian cause. Al-Azhar dedicated a corner of its pavilion to Palestine under the title “2018: The Year of Jerusalem”, presenting an array of volumes dealing with the Arab identity of Jerusalem and its history.